Anan-se-sem: (Twi) AnansiStories, the stories of Kweku Anansi the Spider-Man, owner of all stories. The name "Ashanti is also spelled "Asanti". While some Western Europeans were caught up in the American Slave Trade, in the 17th century history was being made in West Africa. Although the Ashanti/Asanti is the largest tribe in Ghana, there are some beliefs that they had migrated down from Egypt. One belief this is so since they share many names –usually with Egyptian Gods. 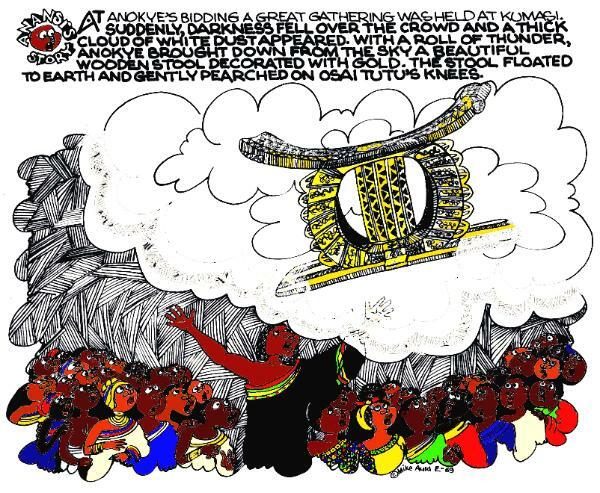 Panel 45 from "The Golden Stool of Ashantu (Asanti)", an Anansesem story by Michael Auld that illustrated the rise of the Asantehene (King) Osei Tutu and the 17th century creation of the formidable Ashanti Confederacy. Panel 49: On a Friday at a gathering of royalty and Queen Mothers in Kumasi, Anokye the Priest, brought down from a cloud of white dust, a decorated Golden Stool that gently perched on Asantehene's Osei Tutu's knees. They witnessed the birth of the Ashanti Confederacy. The Story of the Golden stool of Ashanti not only belongs to these people of Ghana, West Africa, but many descendants who arrived in the Americas during the period of enslavement. It is evident that before their gaining of political power, some were traded to the English as prisoners of war. While the Americas were embroiled in the African Slave Trade, some Akan people were sold into slavery by the more powerful surrounding West African nations. The area became to be called the “Gold Coast” because of its rich deposits of alluvial gold. This is the reason why the Ashanti Kingdom’s dignitaries, ornamentation, jewelry and sculptures area dripping with gold. (See Ashanti gold weights used for measuring gold.) The most revered object to the Ashanti was the Golden Stool, created in Heaven. That the Ashanti became formidable warriors is evidenced not only in Ghana, but by historic Maroon (“Maroons are people who escaped the sugar plantations to join the island’s Yamaye Taíno “Cimarrones” in the mountains). Their leaders in Jamaica were those who successfully and strategically fought the English military in Jamaica. Under Captain Kojo and Nanny and his brother, Quao, obtained independence from the British before the American Revolution. Starting in the late 17th century, the Ashanti king Osei Tutu ( c. 1695 – 1717) and his adviser Okomfo Anokye established the Ashanti Kingdom, with the Golden Stool of Ashante as the sole unifying symbol for the kingdom. 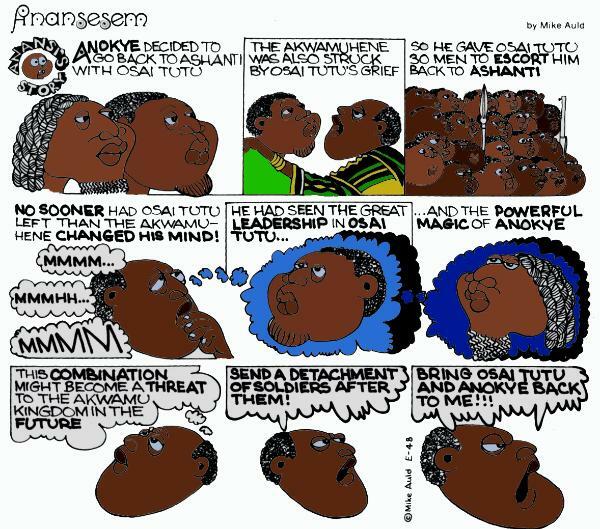 This Anansesem was a researched, published comic strip of a folkloric story about the Golden Stool of Ashanti, Asantihene Osei Tutu and his cousin Okomfo Anokye, the Priest and the founders of the Ashanti Confederacy. WHAT DOES COLUMBUS DAY MEAN TO AMERINDIANS?